Luxury Ghorepani Poonhill Trek with Jungle Safari offers you the blended flavor of trekking and tour. Initially, exploration of Kathmandu valley provides an opportuntiy of being familiar with age-old tradition, civilization, religion and history. Next, we drive to Pokhara, a beautiful and serene city in the heart of Annapurna Himalayas. Our further drive to Nayapool lets us begin our trekking in the mountain via picturesque settlements and lush forest. Enjoying rhythemic waterfalls, lush rhododendron, meeting and interacting with friendly ethnic people, we get to Ghorepani. 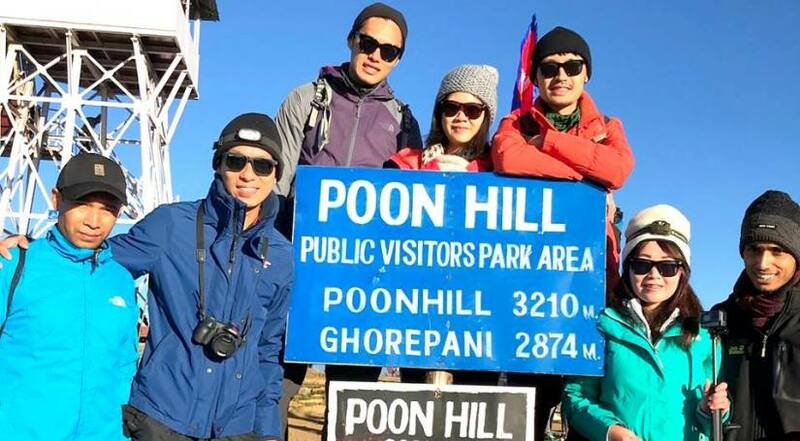 We climb Poonhill from Ghorepani early in the morning which offers us mesmerizing sunrise and mountain views including Annapurna Massif, Gangapurna, Himchuli, Manaslu, Ganesh Himal and Dhaulagiri. 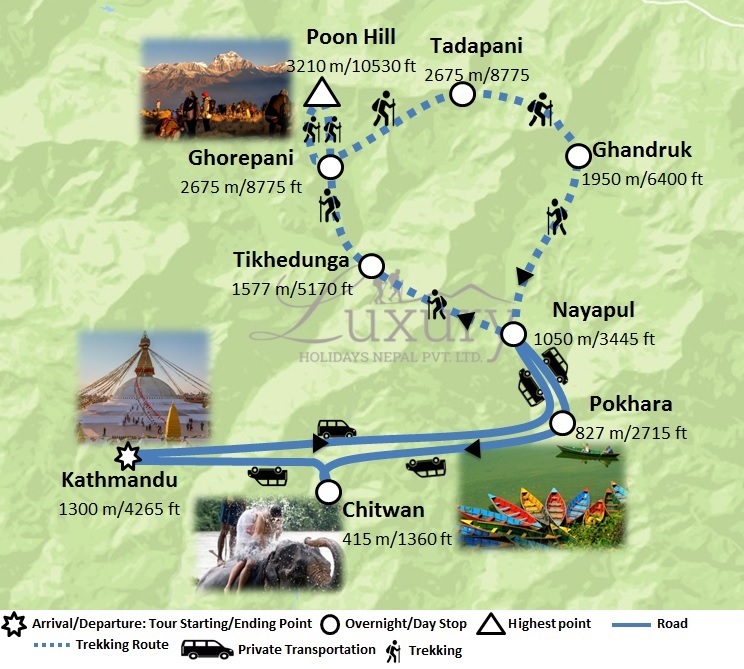 Further, our trek via Tadapani and Ghandruk finally takes us to Pokhara. Then, we explore Pokhara visiting Phewa Lake, Davi's Fall, Gupteswor Mahadev Cave, Talbarahi Temple and also enjoy Boating at Phewa Lake. After a full day sightseeing in Pokhara, we drive to Chitwan. Chitwan National Park is abode to hundreds of species of flora and faunas. Jeep or Elephant safari, jungle walk, canoeing, bird and crocodile watching, Tharu Cultural show are the major attractions of Chitwan. At the end, we drive to Kathmandu to end our Luxury Ghorepani Poonhill Trek with Jungle Safari. Luxury Holidays Nepal offers you 5* Stay in Kathmandu, Chitwan and Pokhara and best quality local lodges in the mountain during the trekking days. After breakfast, fly to Pokhara (known as The Lake City owing to a large number of lakes in the city). As you leave Kathmandu, the landscape changes. You will see hills, small settlements and terraced farms. Drive to Nayapul which takes approximately one hour from Pokhara. Then start the first part of hiking to Tikhedunga (1577m.) via Birethanti (1065m.) this is a pretty easy flat hike as you pass through several small lively villages and settlements. After some time, you will ascend gently to the final destination Tlhedhunga. You will ascend steeply for the first 2 hours and then ascend gently passing through Ulleri (2070m.) and Banthanti. This path gives you breathtaking views of Machhapuchhare or Fish Tail (6997m. ), Hiunchuli (6441m. ), and the grand Annapurna (7219m) south on the way. Your trail now gets quite easy going as you pass through rhododendron and shadowy forests amidst the cackling of birds which gives you good feelings till you ascend gently up to the final camp. After breakfast starts your trek by descending gently all the way through rhododendron, oak and other kinds of dense forests. You will hear different kinds of birds chirping on the way. This is one of the popular destinations for the bird lovers. Ghandruk is a big Gurung village. There is a handicraft center and Gurung museum. From this village you will see the views of Annapurna South, Hiunchuli, Gangapurna (7455m. ), Annapurna III (7755m.) and Fishtail. Overnight at Guesthouse. This is a very easy trek by descending gently half of the way through the rice field and local villages to Syauli bazaar and walks flat part until Nayapul then drives from Nayapul to Pokhara. It takes around one hour to drive and Overnight at Hotel. 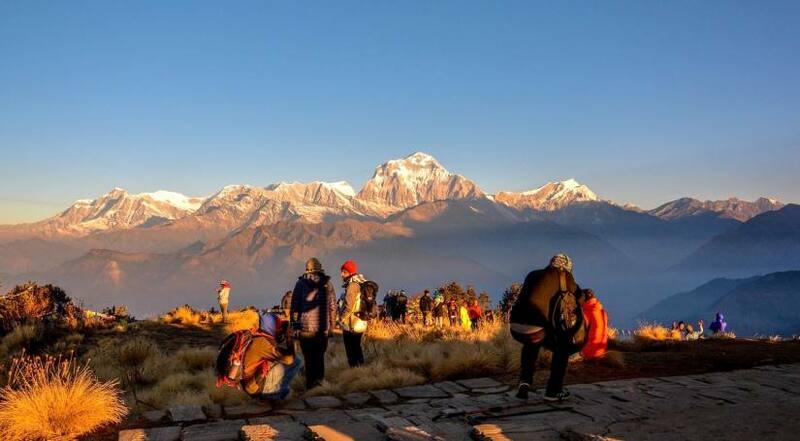 08 Days A full day Pokhara Sightseeing tour. After breakfast drive to Chitwan. The road snakes through the verdant forest to Chitwan. On reaching Chitwan you will be greeted by the hotel representative and will hand you the full schedule of the activities that you will be doing throughout your stay in Chitwan. Then you will have lunch. Lunch followed by a tour of Tharu village and parks visitor center. Sunset view from Rapti River, dinner & cultural program. Canoeing & jungle walk or a visit to the elephant breeding center. Lunch followed by an elephant safari with evening entertainment. Overnight at Hotel Seven Star in Chitwan. You have an option of both driving as well as flying back to Kathmandu. The Chitwan-Kathmandu flight swifts along the Himalayas unveiling Manaslu, Ganesh Himal and Langtang ranges. After returning to Kathmandu, you have the afternoon and the evening to stroll along the streets of Kathmandu for some last-minute shopping. Overnight in Hotel in Kathmandu. 12 Days Departure Day: Transfer to airport. Farewell!! Accommodation in Kathmandu in 5 star hotel (Hotel Yak and Yeti or Crowne Plaza Kathmandu-Soaltee) including breakfast as per the above itinerary on twin sharing basis. Accommodation Pokhara in 5 star category hotel (Pokhara Grande or Similar Category) including breakfast as per the above itinerary on a twin sharing basis. 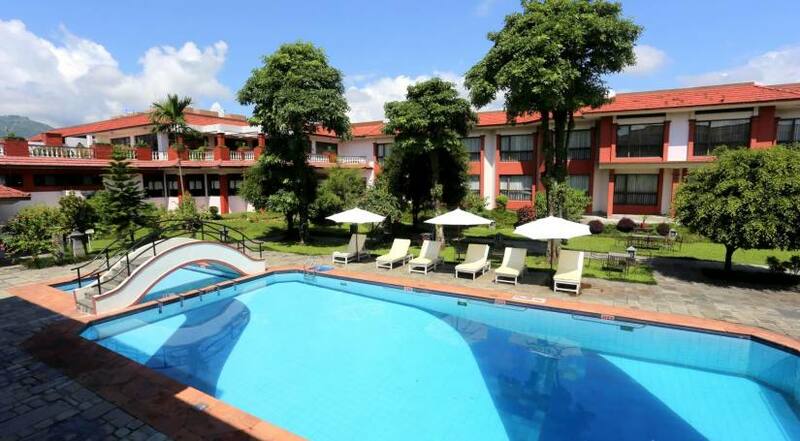 Accommodation Chitwan in 5 star category hotel (Green Park Resort or Similar Category) including breakfast, Lunch and Dinner as per the above itinerary on twin sharing basis. All necessary paper works, Conservation entry permits, TIMS and monument fee. Luxurious transportation from Pokhara-Chitwan-Kathmandu and by private vehicle Pokhara to trek starting point and ending point to Pokhara. Luxury Holidays Nepal's sleeping bag, down jackets, T-shirt, duffle bags, city and trekking route maps - if necessary. Lunch and Dinner while you are in Kathmandu, Pokhara and trekking days (Meal costs about 4 -8 dollars per item depending on the place where you eat). Luxury Holidays Nepal provides you 5 star hotel in Kathmandu, in Chitwan, in Pokhara and best Teahouse/Lodge throughout the journey. Teahouse and lodge have the rooms with just the basics, normally with a bed, blanket and pillows. We will provide you and your group at the lodge which is locally available every day. Accommodation in 5 stars hotel Kathmandu (Hotel Yak and Yeti or Crowne Plaza Kathmandu-Soaltee), Chitwan (Green Park Resort or Similar Category) and In Pokhara (Pokhara Grande or Similar Category). If you have purchased a voucher for the tour, please inform us which tour date suits you as soon as you are certain. We need time to purchase your domestic air ticket and make other arrangements so please confirm your spot on a tour at least 2 months prior to the commencement of the tour. Your booking on a particular tour date is subject to availability of spots. Also, please send us your redemption code and voucher number through this link (See The Voucher Redemption page).